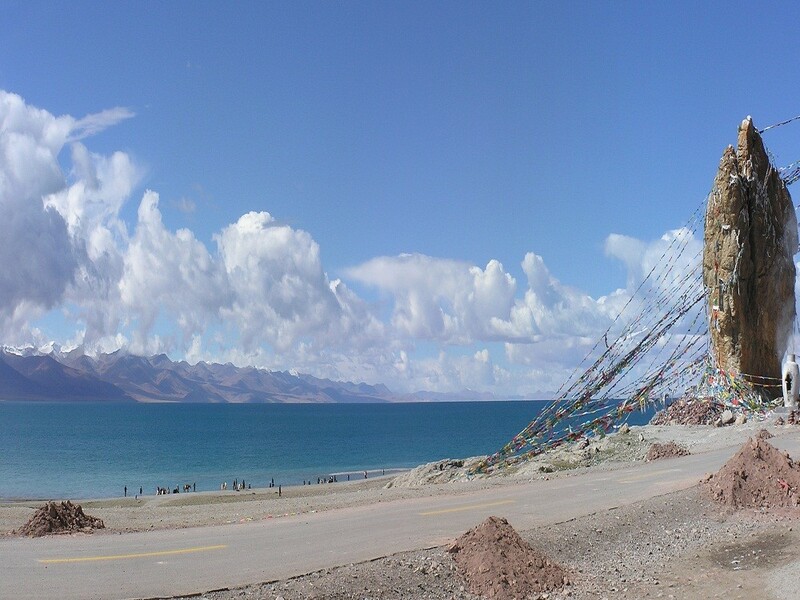 Nam Tso Lake is situated approximately 190 km north-west of Lhasa at an altitude of 4718 m. It is one of the most famous lakes in Tibet as well as being a very important pilgrimage site. In the Tibetan "Nam" means Sky and "Tso" means Lake. The lake plays sanctuary to many species of migrating birds and other local birds. It is the second largest saltwater lake in China, the first being Koko Nor (Qinghai Lake) in Qinghai province. It is approximately 70km long and 30km wide. The Nyenchen Tanglha (Tangula) range, with peaks of more than 7000m, towers over the lake to the south. It is a tidal lake and the ring marks of earlier lake levels are clearly visible by the shoreline. The Lake is easily accessible from Lhasa. While driving to Nam Tso from Lhasa, we cross over the high pass of Yangpachen (5630 m.). It takes at least 21 days to circle the shores of the entire lake. In clear whether the water is a miraculous shade of turquoise and there are magnificent views of the nearby mountains. The wide open spaces, dotted with the tents of local drokpas (nomads) are intoxicating. The best season for trekking in Nam Tso Lake is late May to October, however, you must be prepared at all times for wet weather, snow and cold winds. It is a very remote region so we should carry camping, kitchen equipment and other provision for the entire trekking part. Day 02: After breakfast, full day Kathmandu sightseeing. Day 03: Visa preparation day. Day 04: Fly from Kathmandu to Tibet, Gonggar Airport and drive to Lhasa crossing Yarlung River. O/N hotel. Day 05: Lhasa, sightseeing. Visit Potala Palace, Jokhang Temple, and Barkhor Market. Day 06: Lhasa, sightseeing. Visit Drepung, Sera Monastery and Norbulingka, the summer palace of the Dalai Lama. Day 07: Drive to Nizhong; arrange yak for trekking. Overnight in tented camp. Day 08-13: Trek to Nam-Tso (lake ). Overnight in tented camp. Day 14: Explore around Namtso Lake. 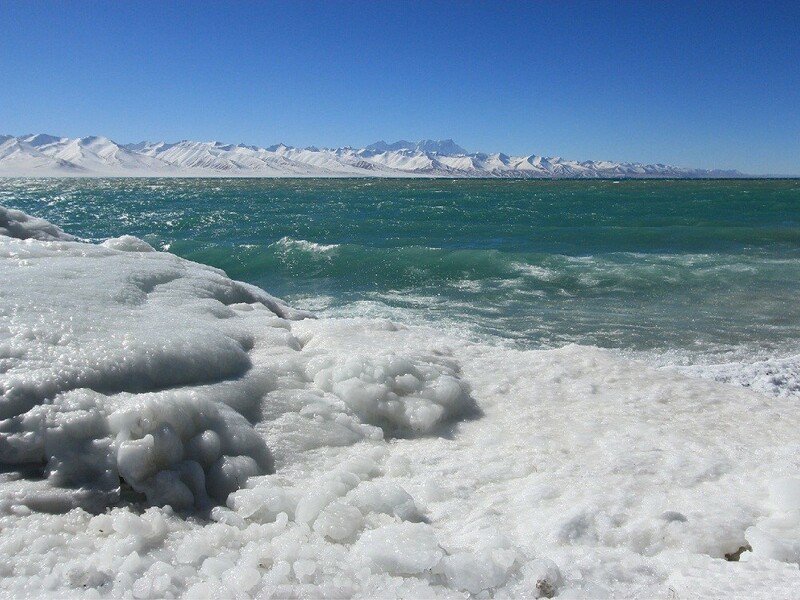 At 4718 meters, Nam-Tso (lake) is approximately 190km north of Lhasa. Its salty waters have a stunning shade of turquoise. Overnight in tented camp. Day 15: Drive back to Lhasa and transfer to hotel. Day 16: Drive to Gonggar Airport and fly back to Kathmandu. Day 17: Kathmandu, free day. 3 night's accommodation at 3 or 4-star hotel in Kathmandu on a twin share basis. 11 nights accommodation in Tibet using guesthouse /camp. Tibet Visa & Permit Fee [Normal]. Services of English speaking guide in Tibet. All Trekking & camping equipment including Gyamo Bags, Sleeping bags, and oxygen cylinder. using extra nights in the lodge (except the mentioned on itinerary). Flight or any costs TO or FROM Kathmandu from your destination/ hometown. No cost is including for those who separate from the main group.